Not everyone will develop Postpartum Depression or have anxiety after having a little one. However, regardless of economic status or race, it affects women across the board. While no one can know for sure who will or will not develop postpartum depression we do know the risk factors. I split risk factors into three categories - Bio, Psycho, Social. Now please don’t take psycho in a negative manner. Remember, a counselor is writing these words, and I promise I’m going to break it down very simply. I figured if you remember Bio, Psycho, Social that it may be easy to remember the risk factors. An easy way to remember this category is your body’s makeup - your biology. This can include a history of infertility, thyroid imbalance, anxiety, depression, or another mental health disorder. You should also consider the health history of your family. This category should also be considered if you have a hormonal sensitivity. Not sure if you do? In addition to discussing with a health professional, such as your OB/GYN, start to consider - do you, or did you, have difficult “flows”, for instance did you suffer from premenstrual dysphoric disorder (PMDD)? An easy way to remember this category is the way you think, perceive and receive. This could include having a perfectionistic personality, lack of coping mechanisms, having an unplanned pregnancy, which may cause a feeling of ambivalence, and even include if you have unresolved loss or trauma, such as a previous pregnancy loss, negative childhood experiences, or significant life changes. You may say, “Wait, I thought this category has to do with the way I think, perceive and receive.” Let me explain further. All the items above can affect how you think, perceive and receive. They affect your beliefs. I call those cognitions. To explain even more, we all have had life events, many in our youth, that developed the way we think about things, how we perceive others, our life or our situations, and the way we think about these things also act as a filter for information we receive. Think about it, women of different ages, races, and life experiences will read this and each will think about, perceive the teachings, and receive the information differently based on their cognitions (beliefs). This category is your relational category and it includes your social support. In this section the quality of your relationship with your significant other can impact your risk level, having friends or family that are able to assist and ones you can call on, is included in this category. Additionally, your relationship with your newborn and other children can impact your risk. For instance, if you are a mother of multiples, if your little one has time in the NICU, or your relationship with your other children are strained, it can impact your risk of developing a postpartum depression or anxiety. Ok, so now that we have briefly discussed the three areas of risk, it’s time to make it very personal. I want you to provide you with a PMAD Risk Appraisal. Please be aware that the PMAD Risk Appraisal is not a screening tool to determine if you will develop a Postpartum mood or anxiety disorder, but rather a tool that can help you access your personal situation and identify areas in your life that may be considered high risk, so that you are able to take proactive steps in reducing your risk. To download your free PMAD Risk Appraisal visit www.postpartumentalwellness.com and enroll in the free The Postpartum Mental Wellness Planner. If you are experiencing anxiety or depression and you've recently had a little one or are currently pregnant you can speak with a mental health professional by scheduling an appointment with Maternal Counseling Services, PLLC, or email help@maternalcounselingservices.com. 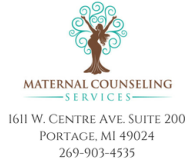 Ciji C. Gamble, MA, LPC, NCC, is a Licensed Professional Counselor in the Kalamazoo/Portage Michigan area, and the owner of Maternal Counseling Services, a counseling private practice that specializes in the care of postpartum mothers. As a counselor Ciji helps women, at all stages of life, find peace in their present and hope for their future. She is the mother of a toddler, wife and a teacher at heart.